I had the privilege of knowing Topsy Jennings; It was Miss Betsy Grasby who first suggested that I should become a local Councillor and then, when Topsy found out she persuaded me to stand for Wivenhoe Town Council in 1983. Topsy was a very determined lady. She had a great sense of fun, a wicked laugh and a strong sense of what was right. Likely this was to do with her schooling. These recollections of her time at the Wivenhoe Girls and Infants School in Phillip Road are an incredible and detailed record of life at the school during the 1930s, and of the teachers like Miss Grasby there. 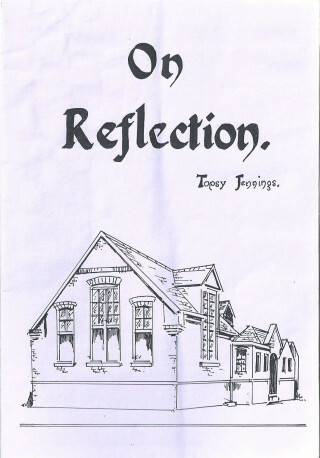 We should all be grateful that Topsy wrote this pamphlet to describe her childhood memories. They are a vivid account of the importance of the school in Wivenhoe at that time. I am grateful to Jane Cole who provided me with this copy of Topsy’s pamphlet. Topsy was christened Ellen Sparling but everyone knew her as Topsy. She sadly died in 1997 aged just 76. IN ‘THE ” INFANTS” – with all the way to go. From the very beginning, each child had a clothes peg in the porch, where there were washing basins, and a clean roller towel. We had our own desks, the ‘babies’ at the northern end of the long classroom, and the second class at the southern. My first day was marked by a sudden event, quite unexpected and very cheering. A pincushion landed smartly on my desk, newly completed by my brother Jack in the other class, One side red and the other blue -I was highly delighted by this happening, whooping as I threw it back. This did not make a good impression, but I was certain that I would enjoy school from that moment, and I did, thoroughly. We had assembly each morning, standing in the space between the two classes, singing a hymn accompanied by a teacher, and saying the Lords’ Prayer. Possibly there was more, but it is a long time ago! On that same space, in the very centre, there was a hole which housed the maypole. On quite rare occasions when I was older, it was erected, complete with coloured ribbons. We danced round this weaving the ribbons, and my remembrance is of the great fun it was – and of the appalling muddles we made. How many schools had a maypole? In those infant school days, there must have been lessons of a kind, but I can only recall beginning to chant the multiplication tables – which lasted a lifetime. At that tender age we used to race home at dinnertime to announce the arrival of the ‘Woolman’. He had a ‘patch’ for his wares displayed on a cloth by the fence in the lane, and for any woollen goods would give a gift, depending on the worth of the wool. An assortment of pencils, pads, beads, marbles, laces, etc., to gladden the heart. In later years, I thought of the families who lived at Wivenhoe Cross, and beyond in Elmstead Road, who did that long trek four times a day in all weathers. I am sure they didn’t grumble – it was part of life. In the Infants’ we had a handkerchief pinned onto our jumpers or dresses (some pinafores!) But once having attained a more mature age, possibly eight years, our hankies were kept in the pocket of our navy blue knickers – very chic and grown-up. My recollection of the classes in the middle of the School is hazy, except that all the basic lessons began in earnest, and continued until one left. Each class had its own teacher, and each teacher taught all the subjects. Arithmetic gradually became fractions, decimals, long division and multiplication. I was definitely not fond of arithmetic, but we did better than the youngsters of to-day with their reliance upon the calculators. Our reading lessons included spelling bees, and our writing gradually developed into a personal style through the school. English compositions and an examination yearly helped, I expect, though they were heartily dreaded. English Literature was to become increasingly absorbing, with works of Dickens, poetry, and Shakespeare, which blossomed into plays. The dates throughout History were well- hated, but we ranged from the cave-dwellers to the pageantry of the Tudors and Stewarts, and it was full of interest. Our Geography was very thorough, and completely different from that of to-day, I believe. Map-reading, foreign countries with their main cities and ports, exports and main rivers, mountains and association with Great Britain. A study was made of the British Isles, and we knew of the cities, the ports, main commodities, and places of manufacture. We were taught to read music, and to sing from the score. There was an event held over a number of years at Clacton Town Hall, for which we were entered. It was an area concert, with many schools gathering there – in the morning for the schools to sing at an audition in front of adjudicators, while in the afternoon a rehearsal was held for the entire gathering, and an enormous choir then sang to a packed hall in the evening. A conductor came from London for this occasion, using on one event sufficient energy and enthusiasm to put his foot through the rostrum – needless to say, this was voted a great success. Folk dancing and Morris dancing were a weekly feature, and the music was supplied by Miss Grasby at the piano. At the Colch­ester Carnival, a great number of Essex schools took part in a festival of folk dancing, and boys from the Wivenhoe Boys’ School joined us as partners. It was a massed display, watched by the audience from the slopes leading down to the Lower Castle Park. I seem to recall that at the end of the dancing, the item was the Circassian Circle, and as there were too many children to make just one, three concentric rings were made which danced round in different directions. I find that I remember the music of this, and a number of other dances – what a strange thing the memory is. Another dancing event was held each year at the Wilson Marriage School, where we took part as a team for the school, managing to win according to my friend Marjorie Goldstraw (nee Cox) every year. Her superb memory was a help to my less able one, and I was grateful. During the winter months, cookery took place. A wide-ranging syllabus was taught, from simple dishes and bread etc., through to Christmas Cake, complete with marzipan and royal icing. The decoration was really something – mostly hilarious. The cookery was taken in a classroom given over to domestic subjects and in the summer a full range of laundry was taught. One day per week was set aside for these lessons, and other days, girls came over the river (by the dear old ferries) from both Rowhedge and Fingringhoe. We never did get to know these girls – I wonder why? There was always rivalry across the river, but we could have been friends, but somehow were not. Most of our fathers were sailors, but surely that was not the reason. We saw their linen hanging on the lines in the playground, but had no close contact. Someone else may remember differently. This was taught with great thoroughness. Every type of hem­ming, all the stitches; cutting out, making garments, the use of a sewing machine, embroidery – and everything had to be finished. I remember a well-hated pillowcase, with the added torture of drawn thread work making it a reluctant, boring effort which I was compelled to finish, even though my friends were on other things. When I finally and thankfully took it home, my Aunt was horrified – But its ‘grey’ she said. It was given to me when I married, and I was sensible enough to realise that the material was of lovely quality, and it lasted many years. On fine summer days, Miss Smith came with us to do our needlework in the orchard. This was a blissful thing to do, for everyone enjoyed that pretty place, while something was read to us. It would have been some improving work, but one could always dream, and the kindness was in taking us there. There was plenty to interest us in Nature Study. We learnt about the animals of the world, the fish in the oceans, insects, about the shape of leaves and trees, and the countryside in which they would be found. There were nature projects, and one in particular that I have remembered all these years was the collection of the wild flowers around us. There were far more then to be gathered, and it is sad to realise how different things are to-day. Harebells grew along by the hedge in Alresford Road, near Keelars’ Lane. On the verges and in the ditcbes, flowers were abundant. Daisies and Buttercups, Rosebay Willow Herb, Cow parsley, Foxgloves, Cuckoo-pints, the tiny Pansy we call ‘kissies’, Mallow, Clover, Trefoil, the small yellow Vetch, Scarlet Pimpernel, Blue Speedwell, and many, I am sure, which I have forgotten. In the woods there were Bluebells, Wood Anemones, Primroses etc., and on a walk down the river wall, one found Bull Rushes, Sea Lavender, King Cups and the bushes of Sloes. On the Broomy Fields all those masses of Broom bushes did the heart good, not to mention the blackberries, and the tiny purple Orchids. Such a wealth of wildflowers and plants, while in the cornfields all around us grew Poppies, Cornflowers and Scabious – and the unforgettable sight in childhood of a field of Mustard next to a field of Blue Flax, just above the Cross was pure magic. I believe we did work on a project entailing frogspawn to grow into frogs, but I am not fond of such livestock, and capable of entirely forgetting it. The various art subjects were taught by Miss Grasby, and I marvel at the wide-ranging scope of our work, and the high quality of the knowledge she imparted. We painted in watercolours – one of the simpler subjects. Gesso work, mainly on boxes previously painted or decorated, which was a very pleasing thing to do. To decorate the inside covers of the small books we made, we were shown how to do marbling, by trailing the paper across a small bath of water, the surface of which was coloured with oils. The outside of the covers was sometimes finished by combing (colouring a fairly thick paste and making patterns with a steel comb). We had our looms for weaving, having first been taught the names of all the parts, and the process of setting up a complete loom. Place mats were woven, scarves and purses etc. -another satisfying craft. Lettering, or calligraphy, seemed to go through the top classes in a lengthy way, probably because of the practice needed for the strokes to be formed properly. The work was done on cartridge paper, and sometimes on vellum, which seems to have disappeared these days. The work was illuminated with paints; gold, and Indian ink to form decorative first letters and perhaps patterns down from the letter, across the page – perhaps both. Mainly, I remember the tremendous enthusiasm we had for rounders, played under the supervision of Miss Grasby, who ex­celled at so many things. There were times when we challenged the Boys at rounders, knowing full well that it was our game. Knowing also that we would be invited to a thrashing at cricket – though some of us did play. All these activities were much enjoyed. We trained for a sporting event between Schools, but the details I cannot recall – only the sight of Iris Wheeler (nee Scott) soaring over the high jump in the playground practice. What a fantastic sportswoman she was. We were kept up to date with important topical matters, and took part in a number of parades. One was for the Jubilee of King George V and the children were presented with mugs. At this time, Mr. Gibson Schofield handed over his land to become the King George V Playing Field, a well-loved and much used amenity. Ever since it has been a pleasure to go there, lovely to look at, with its sweep down to the river, the woods and view of Rowhedge. Another parade was when we entered with the theme of Belisha beacons, which had been introduced at that time. Our school days were well filled, for we were taught a wealth of subjects, and so very thoroughly. The school was run by Miss E.N. Smith, a disciplinarian of the highest order, for whom we stood when she entered the classroom, commanding a great respect. I shall always feel that it was a privilege to be a pupil at Wivenhoe Girls’ and Infants’ School, and look back with gratitude for the friendships which are still as strong to-day, the pleasure and interest of those years of years of work and play. Mixed with the memories of schooldays, there are those other moments in childhood which last a lifetime, mental pictures which are there, thankfully, to be recalled as part of life in Wivenhoe at that time. There was the tremendous thrill which never failed, of the launching of a ship, either from the yard of Jimmy Husk, or from Rowhedge. Our families were closely involved in the work of the shipyards, which had a very fine reputation. Much of childhood was linked to the river, which affected the lives of so many of the old families, and drew the young people like a powerful, irresistible magnet. Always of interest were the yachts which used to lay up along the wall – the Rosabelle, the Valfreyia, with their springy gang planking stretching from the wall to the yacht, and had to be tried. To stand at the third stile and watch as many as nine quiet, lovely barges sailing up to the Hythe – at times with porpoises play­ing around them. And to think now, that in those days it was quite a common sight. Another river episode was captured on photographs locally, and I believe that it was unique as a weather condition. In the exceptionally severe winter of 1929 I suffered frustration and temper in seeing my brothers jumping from one ice floe to the next, to reach the bank at Fingringhoe, and not be allowed to join them. It was many years before I realised how extraordinary was the sight of all those icebergs floating down the river – hut many others will remember it. They will remember too, when Bobitts’ Hole used to freeze over, and the line of boys waiting to take their hard run to that long glassy slide over the ice, then to run back and do it all over again. This was serious stuff – no little ones allowed. More ice was enjoyed down on the marshes, where the dykes and ditches were a challenge. This resulted in freezing wet trousers, but I don’t remember that trifling matter making any difference. There was a certain very beautiful light which came to the cricket field after a fine sunny day, and becoming dusk. People haven’t talked about this, but others must have seen it. I read somewhere of a particular light in East Anglia caused by the flatness of the land, and perhaps it was that. I thought of it as the long light, seeming to go across that field, to where grew the highest Elms in Essex. It is seen sometimes by the river. An unforgettable evening was when I last saw a herd of deer in the Park (now the University grounds). With a friend, I stopped at the Low Way, just past where the traffic lights are to-day. We looked at a group of over 50 deer, and I was told to remember it, for they might not always be there. The war began shortly after that, and the deer disappeared – no-one seemed to know when or where. Part of the young years, part of Wivenhoe itself and part of being a member of one of the old families who lived here, to work and sail, to be fishermen and keep the shops, to poach in the woods, and smuggle from the ships. Part of a place where men would take to a small boat in an icy northeaster and rescue from flooding some of the elderly or ill in the middle of the night. There was always a helping hand for another family, a blessing from all knowing one another in a close community. We had a fine school and a proud heritage. 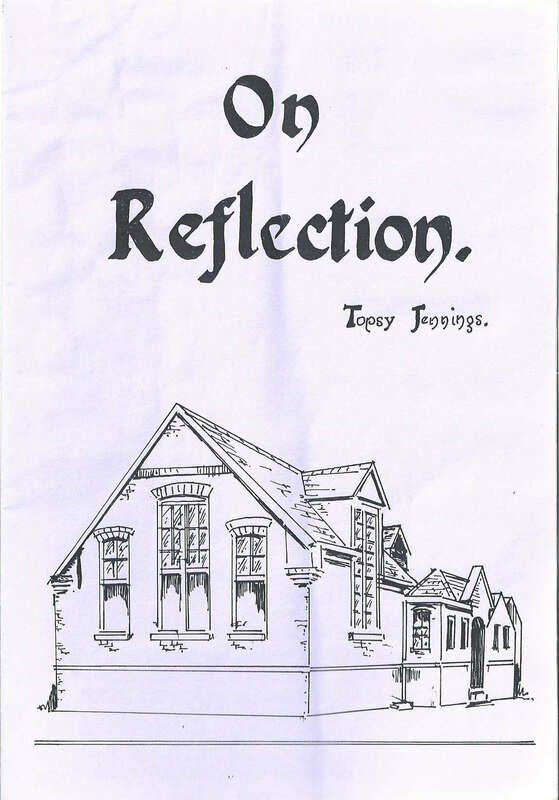 Note: This pamphlet was written by Topsy Jennings to celebrate the Centenary of the Wivenhoe Girls’ and Infants’ School building in 1991. It was typeset and printed by Mike Downes of Modern Printing Services – Wivenhoe.